~Nil. : I have a lot to say. Hello, there. I wouldn't call this post completely fictitious, it's a...different style of writing that I attempted, to free my head of certain epiphanies and visions that were rather vociferous. 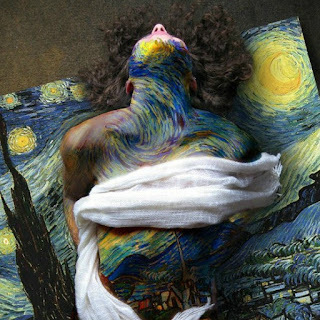 It was stimulated by Van Gogh's Starry Night. And call it crazy, I found just the variation of the painting I wanted, online. So the following is somewhat a cornucopia of strings of thoughts, that came in one after the other while I was in the strangest mood, and I never stopped. It may not make sense, due to the drastic transitions of odd imagery. But it's raw and unedited. That should be intriguing enough. I have a lot to say about your catastrophic ways at romance.The kind which elevate your lovers just enough to bring them down on hard rubble, away from the skies and your red skirts. The deep rings of the ocean will coo deep within the marine land which would then birth the butterfly effect, around the world. You never considered the golden strings around that quiet cocoon which conceived an unholy crossbreed of the moth that resigned to growth. All those tales which sing the hymns of Juliet aren't all that forlorn, anything that's been a part of history has stirred, moved, revolted, and been enshrined in script, in mind- though very few in heart.There's a brothel in your mind, perhaps there might be a temple, even. The point of reckoning being, there's a threshold to both them abodes. Each threshold holy to its indweller in their own ways.There's a sense of exhilaration in the careless free-fall of ash. That sense of exhilaration magnifies at the cinch attempt of beating that ash to dry paste. The salt and pepper like appearance brings about a silly sensation of appeasement. The heart has been an immigrant to seek, it can also be an emigrant to leave. Ultimately, words when spoken are relative, for they are evanescent once the will erodes and the thought is forgotten. What is fearless? The absence of fear may sound splendid, but uncommon. Is 'fearless' a state of insensitivity when the repercussions fail to inflict any sort of effect on you? Because then it wouldn't be such a glorious feeling after all. In all its ignorance it may give me the attention that would tame me. However in the midst of all the shenanigans your existence may be party to, there lies an order in the desperate disorder of chaos. Now isn't that brilliant and inspiring? Thank you, Yvonne. So kind! Van Gogh is my idol! Love the starry night. And I love the way you write- this one's different but nice. Provoking, even. I hadn't thought much of the paintings until recently.. They're gorgeous, fact. What does one have to get to get such vivid thoughts? I mean an extraordinary painting can stimulate such thoughts? Yessssss, I have seen that poster and it's ingenious! Oh, and Van Gogh. Nuff' said. Everyone has a saint and a sinner in himself, the one who shows up is a matter of personal preferences and taste, and maybe the situations too, but that becomes insignificant because men created bindings, collectively called character.But inside every tumultuous meanderings and hurricane, lies an eye, which is inherently peaceful, and oblivious to anything around. Or maybe, that is what we call being fearless. Absolutely brilliantly put, Blasphemous! Perhaps tonnes to ponder over. Food for thought, at its best that explanation. A small little something for you..
That is, indeed, both brilliant and inspiring. And I think you found the perfect image to go with it. Love that variation of Starry Night and your personal words. oh my .. I need to learn from you how to write .. this is so very beautiful.. you have such talent bravo and kudos.. Thank you so much, you're much too kind! A random eclectic mix of thoughts but you nevertheless established an underlying essence of ordered chaos...That ain't easy !! Why, thank you Ankur. Humbled! Fearlessness is a state of being where something else takes priority over the desire for continued existence. Stewie Griffin is my homeboy.